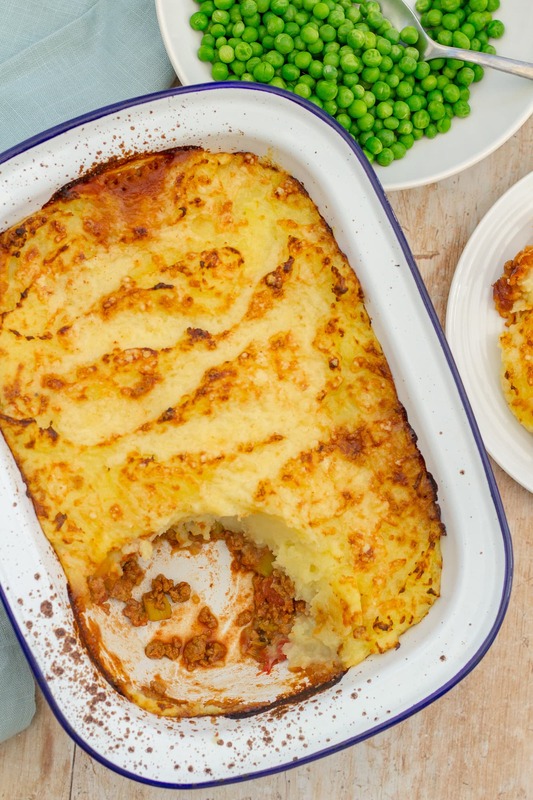 A delicious, easy, family friendly classic with a twist, this Quorn Shepherd’s Pie uses Quorn mince instead of the traditional lamb, meaning this version is both vegetarian and much quicker to prepare – perfect for busy weeknights! The name of this dish has always been a bit of a problem. I am fairly convinced there is no such thing as a Quorn shepherd, nor indeed a quornherd, and certainly I doubt there are any vegetarian shepherds out there. (Do let me know if you know of any!) 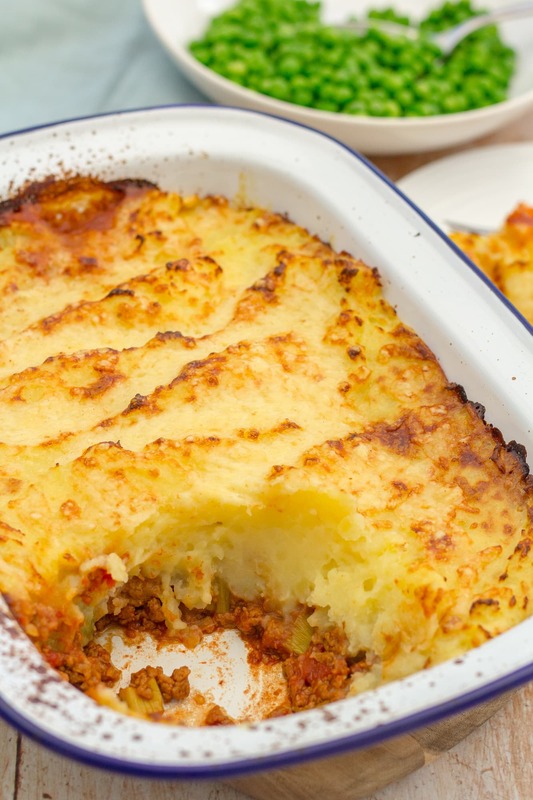 But regardless of the silly name, this Quorn Shepherd’s Pie is comfort food at it’s best. Quorn mince in a delicious kid (and adult) friendly tomatoey sauce, topped with wodges of cheesy mashed potato. Pure bliss! Quorn is one of my favourite freezer standbys – I always have a pack of the mince and ‘chicken’ pieces in my freezer for quick, cheap and easy midweek meals that I know my kids will love and for ’emergencies’ – if plans change, and I need a meal in a hurry I know that with a stash of Quorn in my freezer I’m only a few minutes away from a healthy, tasty meal. 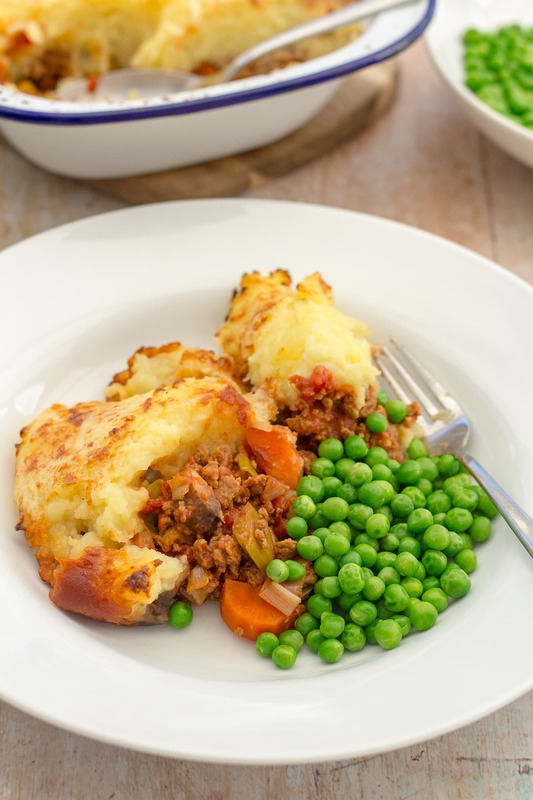 Using Quorn mince makes this dish speedier and cheaper than a traditional lamb shepherd’s pie, but in my opinion just as tasty! 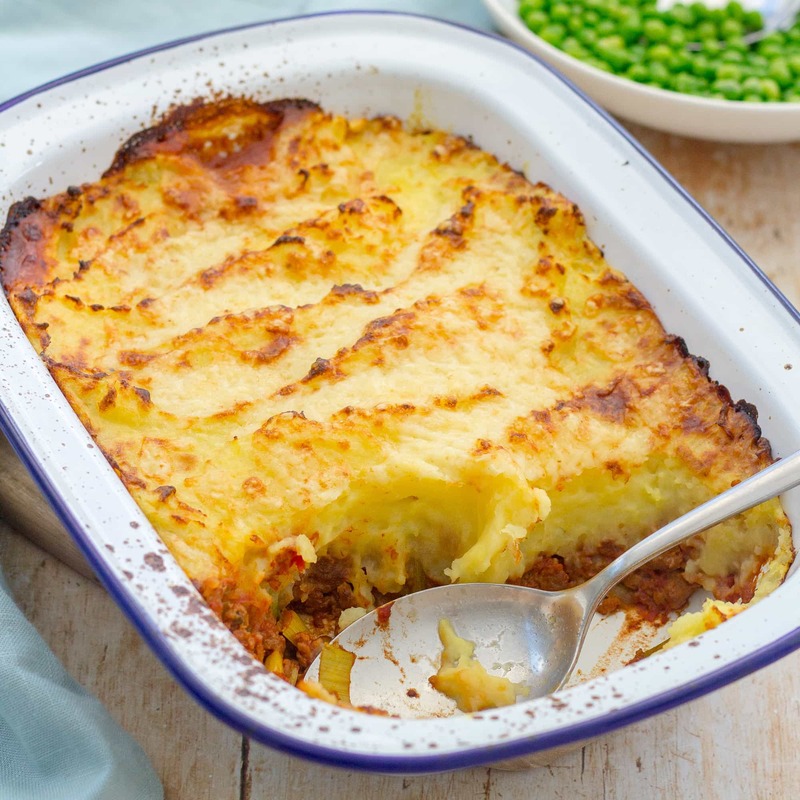 Alongside the Quorn, I’ve also packed in some healthy veg: mushrooms, leeks and carrots, which work so well with the other flavours and means this vegetarian shepherd’s pie gets you a long way towards your 5 a day! Serve with peas, sweetcorn or whatever veg you fancy for a simple, but very delicious midweek meal. 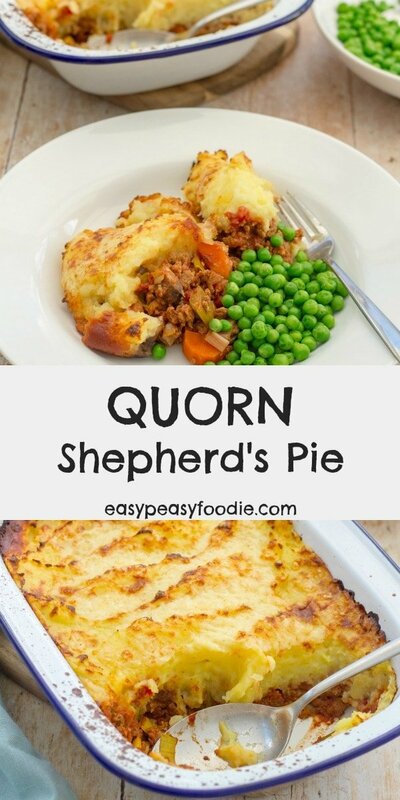 This Quorn Shepherd’s Pie is one of our family favourites and I hope it will become one of yours too! If you like Quorn too, or you want to try it out, there are plenty of other delicious Quorn recipes on Easy Peasy Foodie. You could try my Quorn Chicken Pie, my Quorn Chilli Con Carne, or my own personal favourite, my Easy Quorn Bolognese! 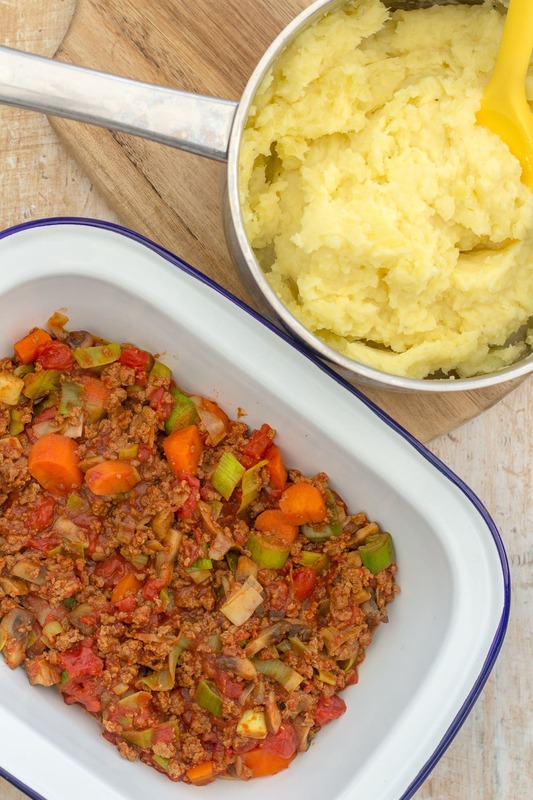 A delicious, easy, family friendly classic with a twist, this Quorn Shepherd’s Pie uses Quorn mince instead of the traditional lamb, meaning this version is both vegetarian and much quicker to prepare - perfect for busy weeknights! Peas and / or sweetcorn to serve or whatever you like! Preheat the oven to 200C / 180C fan / gas mark 6 / 400F. Peel, chop and boil the potatoes for 15-20 minutes, until soft. Meanwhile, fry the chopped mushrooms in the olive oil on a fairly high heat until they start to go brown. Lower the heat and add the chopped carrots and sliced leek and fry gently for 3-4 minutes. Add the Quorn mince, some black pepper to taste, a veggie stock cube and fry for 1 minute. Add in the tin of tomatoes, plus half a tin of water and the tomato puree. Stir to combine. Bring the mixture to the boil and then lower the heat and simmer for 5 minutes. While the tomato mixture is simmering, drain the potatoes and mash them with 75g of the cheddar cheese plus the butter, a splash of milk and salt and pepper to taste. Put the tomato mix at the bottom of a deep oven proof dish and spread the mashed potato on top. Sprinkle on the remaining cheese and put the shepherd’s pie in the oven for 15 minutes, until it is bubbling and brown on top. Just before the shepherd’s pie is ready, cook some peas and / or sweetcorn to go with it – or whatever veg you fancy!